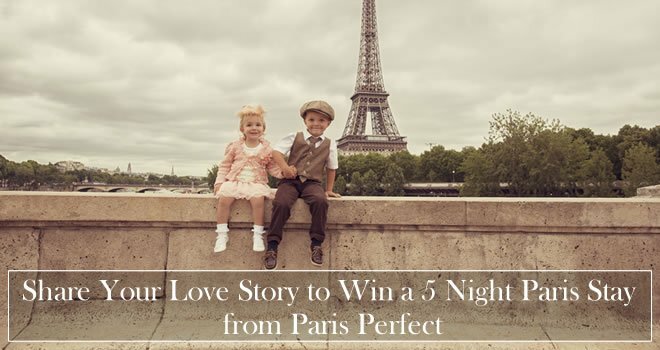 Our Paris Perfect team was recently asked by a guest where to propose to his girlfriend in Paris when he comes next spring. He is staying at the lovely and romantic Calvados apartment, where the balcony has been the ideal location for a number of engagements in its history! You can even find candle wax on the paving where numerous suitors have lit dozens of candles in preparation for the special moment. Our team had a wonderful time gathering some of our favorite romantic spots. Paris is a city of romance everywhere you turn, but here are some perfect places for saying “I love you,” surprising your loved one with a renewal of the vows or popping the big question in Paris! Towering above the rooftops of Paris, lit with a golden glow at night or sparkling during the magical light show each evening, the Eiffel Tower is the classic spot in Paris to say “I love you.” Its romantic allure also makes it one of the most popular and irresistible spots to pop the question to your partner. Even Tom Cruise asked Katie Holmes to marry him on the second floor of the Eiffel Tower, and the whole world knows how that turned out! Another favorite is to make reservations at the Jules Verne restaurant on top level of the Eiffel Tower for a romantic and memorable proposal. 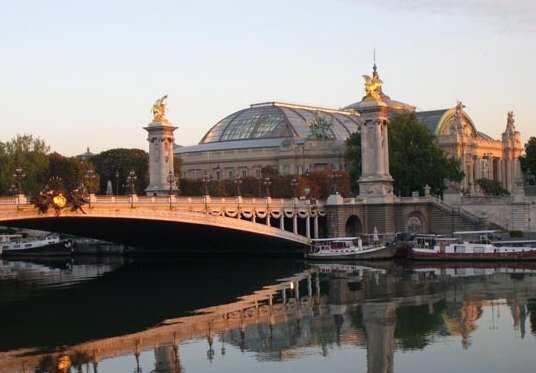 One of our team’s favorite romantic spots in Paris is the beautiful Pont Alexandre III bridge that crosses the Seine between the Invalides and the Grand Palais. At sunrise or sunset, the golden statues and beautiful lamps create an unforgettably romantic setting overlooking the Seine River. Surprise your loved one with a moment of romance on one of Paris’ most lavish and beautiful bridges! The Promenade Plantées is very romantic and off the beaten path spot to pop the question. Once a railway line that has been cleverly replanted with charming gardens, it’s a lovely spot for a Sunday morning stroll. Stop by Le Reservoir for a Sunday jazz brunch, listen to fantastic music and then enjoy a stroll along the promenade. The palace and gardens of Versailles are a dreamy setting for your romantic moment or special proposal in Paris. Why not rent bikes and ride to the opposite end of the Grand Canal and propose with the chateau as your backdrop? Don’t forget the bottle of wine or champagne and picnic! 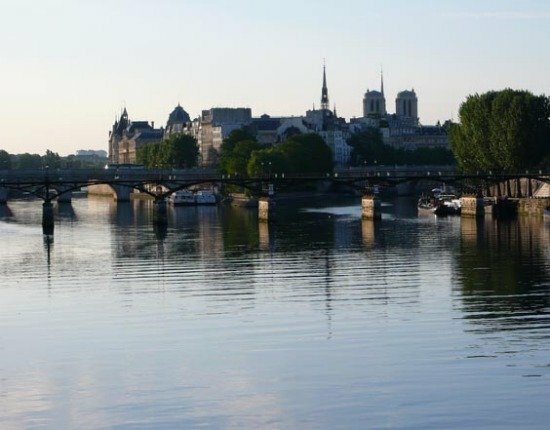 Strolling along the Seine River and crossing one of its many bridges is a favorite leisurely pastime for romantics. Another perfect spot for saying “I love you” or asking that magical question is on the pretty Pont des Arts bridge. This pedestrian only bridge is a very romantic spot located near the Louvre and overlooking the Ile de la Cité. If you’re in search of a peaceful garden setting for your romantic moment in Paris, visit the stunning English-style gardens at Parc Monceau. Propose to your loved one while strolling through the landscaped gardens and over the picturesque bridges. You’ll find Parc Monceau northeast of the Arc de Triomphe in the 8th arrondissement. With the Louvre as a backdrop, the Carrousel du Louvre is an impressive setting to wow your loved one with a romantic surprise. Sunset is the perfect time, and the setting is made complete by one of the many musicians you’ll often hear playing in the arcades. Another romantic favorite is to rent a little paddle boat in the Bois de Boulogne gardens and propose floating on the small Lac Inférieur. Pack a picnic and enjoy a relaxing stroll through the gardens with your loved one for an unforgettable day in Paris. Across the Seine River from the Eiffel Tower you’ll find the Trocadéro and beautiful Palais de Chaillot that houses the Musée de l’Architecture. On the top floor of this fascinating museum, head to center window that looks straight out to a perfectly framed view of the Eiffel Tower. What a romantic spot to propose or say “I love you!” You’ll also enjoy strolling through the lovely first floor and across the Seine to the Eiffel Tower. 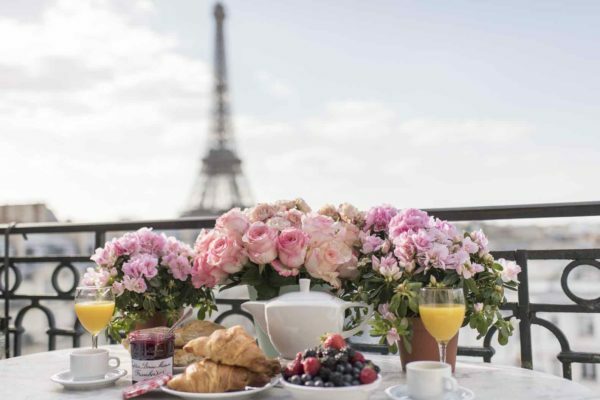 Of course, one of our guests’ favorite spots for proposing, renewing vows and treasuring romantic moments together is on the balcony of one of our Paris Perfect apartments. 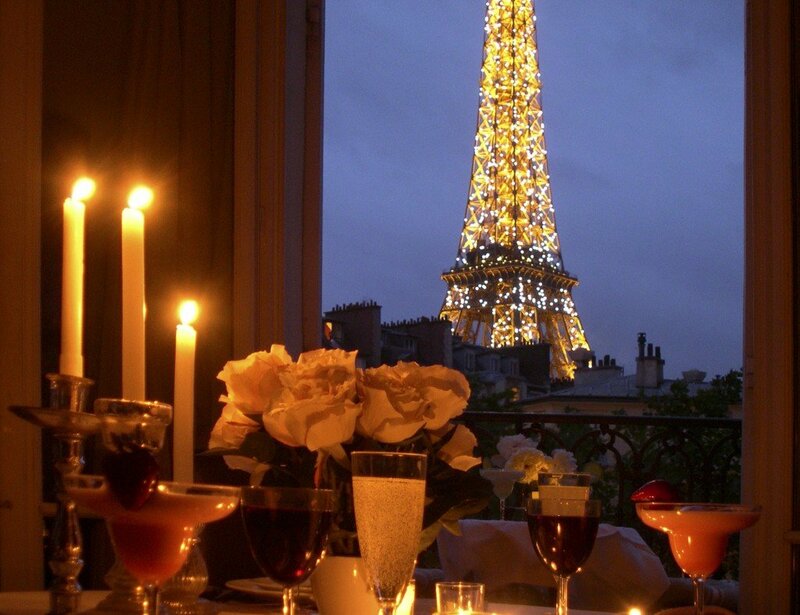 Many feature those absolutely stunning Paris views that make a magical setting for romance. We know guests are going to fall in love with the incredible Eiffel Tower views from the Viognier, our newest Paris Perfect apartment. This gorgeous 2 bedroom, 3 bathroom vacation apartment has unbeatable views of the Eiffel Tower from so close you’ll have to pinch yourself to believe it’s real! 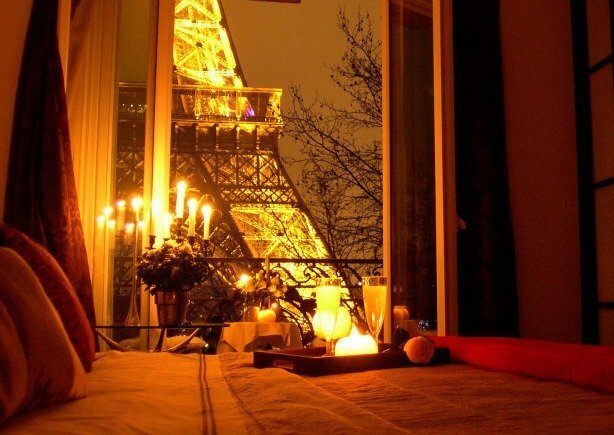 We think the Viognier has one of the most romantic bedroom view of the Eiffel Tower – simply magical! Our Chablis studio apartment in Paris is top pick with guests looking for the perfect spot for romance. The Eiffel Tower soars above the large French windows in this charming apartment in the 7th arrondissement. Our romantic Chablis holiday apartment – perfect for romance! 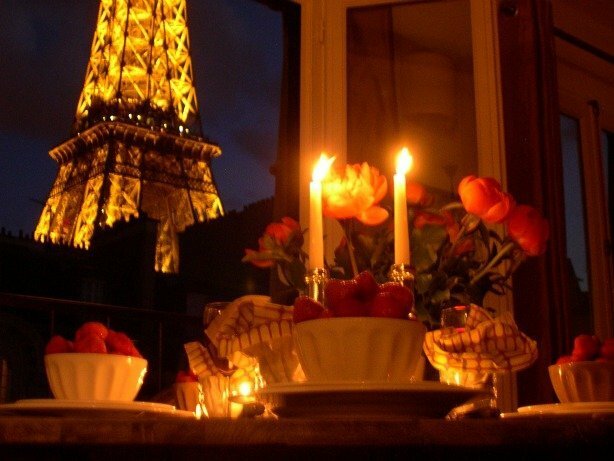 If you’re planning a special moment in Paris, our reservations team will be thrilled to help you find the perfect apartment and suggest tips for creating an unforgettable romantic holiday in Paris! We thank Anthony and Audrey from Oneandonlyphotography for contributing some of the beautiful photographs they have taken of couples in Paris. They capture magical moments in Paris so incredibly well, including proposals, weddings and honeymoons. Ian Holmes is another excellent photographer in Paris whose photos also appear above. Ian was originally a fashion photographer and was asked by a client to photograph his wedding. He was afraid to do it since he wasn’t formally trained to do weddings, but the client insisted and was delighted. Now based in Paris, Ian offers romantic portraiture in the worlds most romantic city. Simply contact through his website to arrange a photoshoot. Posted on Thursday, February 2nd, 2012 at 11:15 pm in See & Do. You can follow any responses to this entry through the RSS 2.0 feed. You can leave a response, or trackback from your own site. Can you put up the link to the new apt you mentioned in this article-the Viogner? What wonderful location suggestions. One could make that a marvellous walking tour for a day. Might take my Sketch tour on that one. Well. My husband proposed to me (sixteen years ago now!) on the deuxieme etage (sorry, I don’t do accents on this keyboard! ), pilier est of the Eiffel Tower. Wonderful, wonderful memory. We were very lucky to celebrate the 15th anniversary of the proposal with a trip to Paris last fall! Of course we stayed with Paris Perfect. It was a completely perfect vacation with our four children. MANY things change in fifteen years! Ian took our family photos that week. Our meeting with Ian was my absolute favorite part of our trip, and I cherish those pictures he took of all of us. I can’t say enough good things about him! Last spring we stayed with my dad & his girlfriend (now my new step-mom) in the fantastic Touraine apartment. He proposed to her one night on the Eiffel Tower – a wonderful surprise! Hi Stacey, thank you for sharing your lovely story. It certainly doesn’t get much more romantic than an Eiffel Tower proposal! We’re glad you enjoyed your stay and look forward to welcoming you again. Hi, Madelyn; This pair of old clients, quite by accident, caught your great appearance on “House Hunters, International”, last evening. What a nice surprise!. But, it wasn’t acting for you, was it! You were doing what you do every day with great style and flair. Brava! We’re planning our 3rd return to a ParisPerfect apartment for next Autumn. Our big anniversary calls for a padlock on Pont des Arts we think. Thanks for the snapshots of your staff, It’s nice to put a face with a voice.